* All medicines, supplements, herbal tinctures are not included in this consultation fee price. Every naturopath at New Leaf is a registered member of the Naturopaths & Herbalists Association of Australia. As of 1st April 2019 the Australian government have changed how you can claim for your treatments with Naturopaths from your private health fund. We have been working hard to have this decision reversed, and are confident it will be at some point in the near future. Please contact your health insurance and your local member of parliament to speak with them about how you can help reverse this decision. 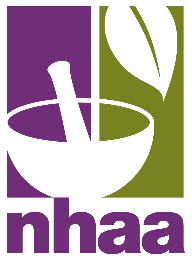 The NHAA is the oldest complementary medicine association in Australia. They have a long history in the Complementary Medicine field and have always set standards and been active at both the political level and at the coal face of clinical practice and education. As an NHAA registered naturopaths, the clinicians at New Leaf have proven that their educational and ethical standards are of the highest quality and they strive to continue to learn and study at every chance they get.